Reflection Bay Golf Course Yardage Chart as of date of last review. Reflection Bay Golf Course Hole 1: A great and very difficult start to the round features a tee shot that must cross water and avoid it to the left as well. Once mastered, the golfer is left with a mid to short iron to the shallow green over another lake. Anything left or short is gone but there are bunkers awaiting a shot that is hit too far, leaving a very tough up and down. The left and right halves of the green each slope away from center. Reflection Bay Golf Course Hole 4: The tee shot here on the downhill par four is partially blind, but the golfer can stay to the left and have a little longer shot into the green or they can cut off a bit of the blind corner and be left with less distance. Over there, however, are hidden desert and bunkers. 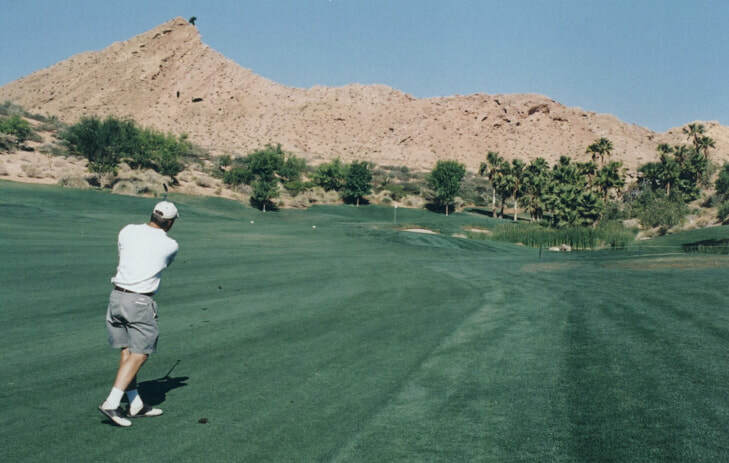 Reflection Bay Golf Course Hole 5: Uphill and long, this par four has a tough drive with the desert canyon all the way down the left. The green is fairly accessible, but will still require a mid to long iron for most golfers. 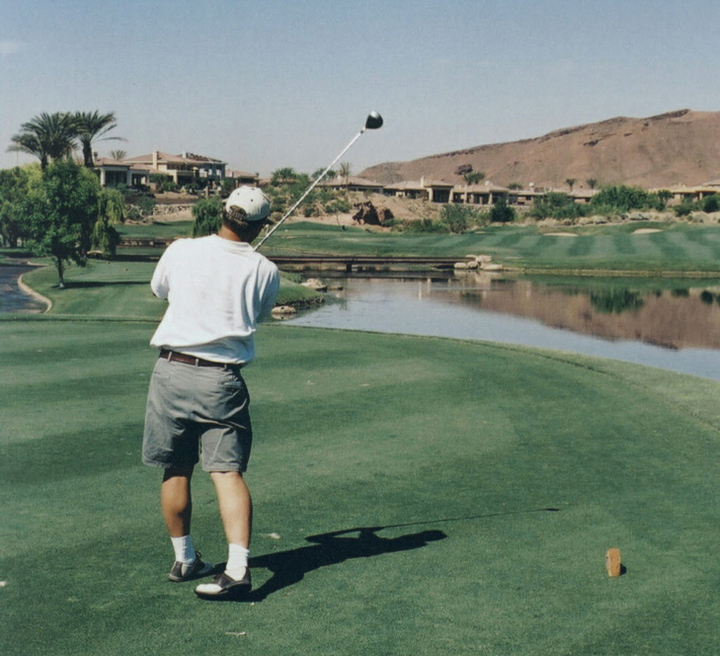 Reflection Bay Golf Course Hole 6: The tee shot on this par five is target golf and provides a beautiful view of the shots to come and the rewards and penalties facing the golfer, depending on the drive. 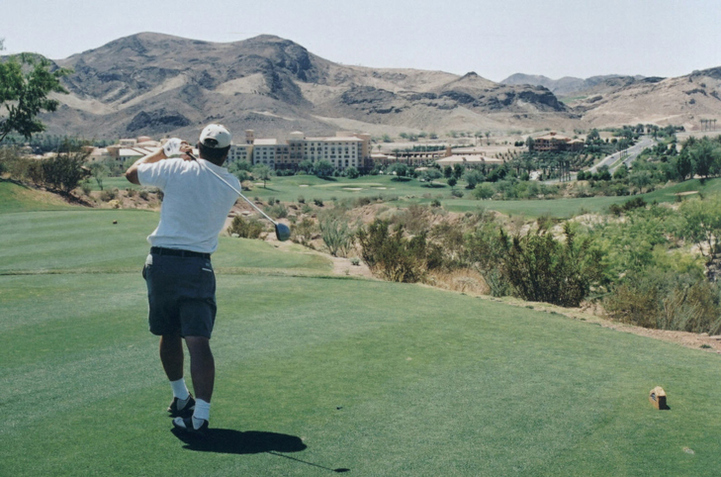 Anything left will find the desert wash unless it flies close to 300 yards, but the closer to that wash the golfer gets the better chance of getting home in two with a green only accessible from long range from that angle. Played as a three shot hole, the second and third shots are more manageable, with right pin placements being the most difficult. Reflection Bay Golf Course Hole 8: The first peninsula par three on the course gets the designer's signature, for good reason. There is no real bailout area unless the golfer finds the bunker to the left of the green. Also, the putting surface is firm and a low shot will be difficult to keep from rolling off the back into the water. Reflection Bay Golf Course Hole 9: The last golf hole of the front nine is akin to a desert version of 18 at Pebble Beach, in reverse. However, this one is less dramatic and with a much more wide fairway. The drive has a very similar set up with a bunker complex in the middle of the fairway being akin to the trees at Pebble. 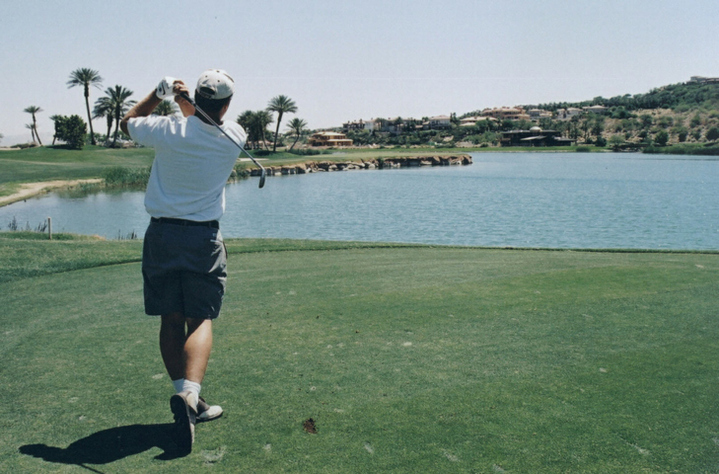 To get home in two, the shot must be played between the bunkers and the water, or over them. However, even if played as a three shot hole, the final approach is still close enough to the water to elicit some jitters. 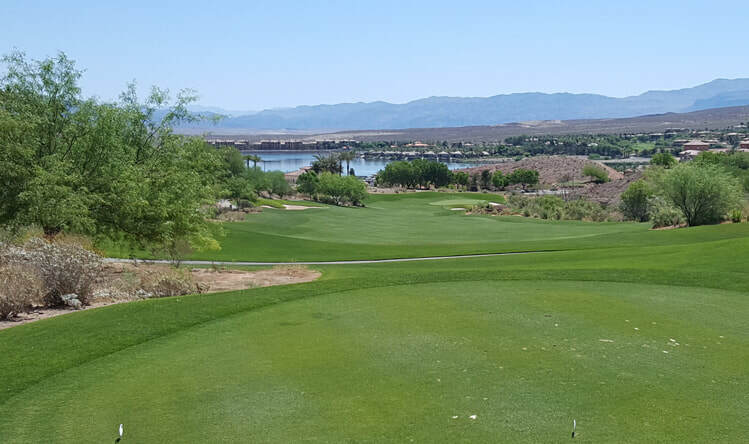 Reflection Bay Golf Course Hole 14: This par 5 has a very intimidating tee shot as the fairway slopes towards the desert wash on the right side that has a man-made creek meandering down it from the green all the way to the landing area. The second shot need to be played uphill between the creek and fairway bunkers on the left to leave a good approach to a small, multi-tiered green accessible to the player by crossing the pond right of the green via several large stones. 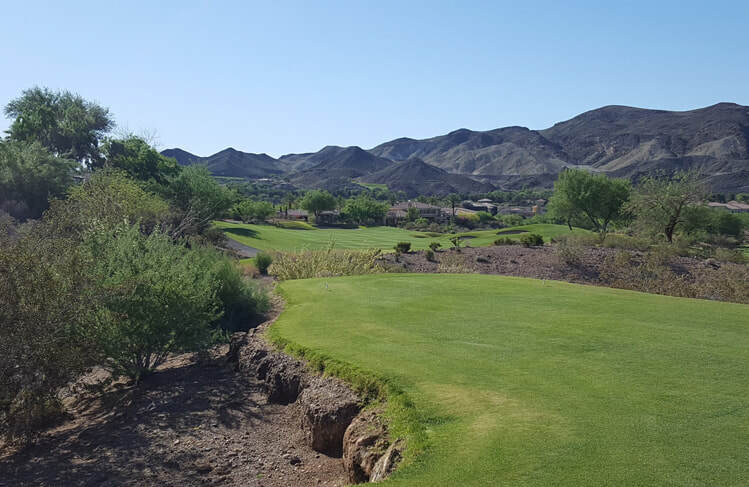 The sloped mountain behind adds to the vistas of this golf hole. Reflection Bay Golf Course Hole 15: Long and downhill, this hole has nice views but tee shots will want to run right when the hit the ground so that pushes everything towards the hazard. The green is angled and there is a troublesome run-off behind the green to the left that makes hitting the surface paramount. Reflection Bay Golf Course Hole 16: This par four is a split-fairway masterpiece with a creek dissecting it. The safer play is to lay up about 230 yards, to the left of the creek. However, this leaves a very long approach to the green, which is surrounded by bunkers, including one behind the green that will actually save most balls from rolling into the lake that go too long. The aggressive drive must fly at least 250, but will leave a short pitch to the beautifully designed green that wraps around a pesky pot bunker front and center. 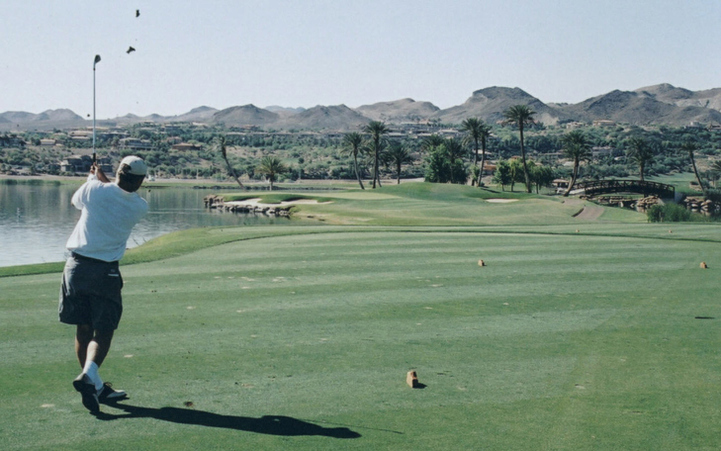 This is a truly gorgeous golf hole and a fun test of golfing skill. Reflection Bay Golf Course Hole 17: The second of two almost mirror image peninsula par 3 holes on the course. This one is much longer, but more forgiving, however, as there is a bailout area to the right. It is, nonetheless, a tough tee shot and a great hole with left / back pin placements quite daunting. 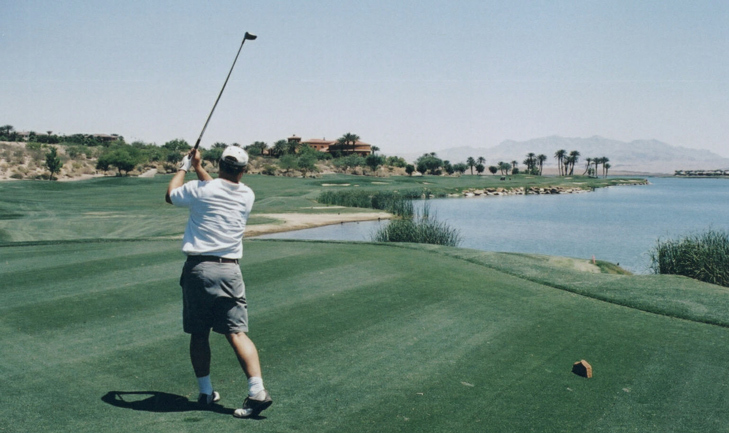 Pick from over 10 Las Vegas Golf Course Reviews to Read Next. 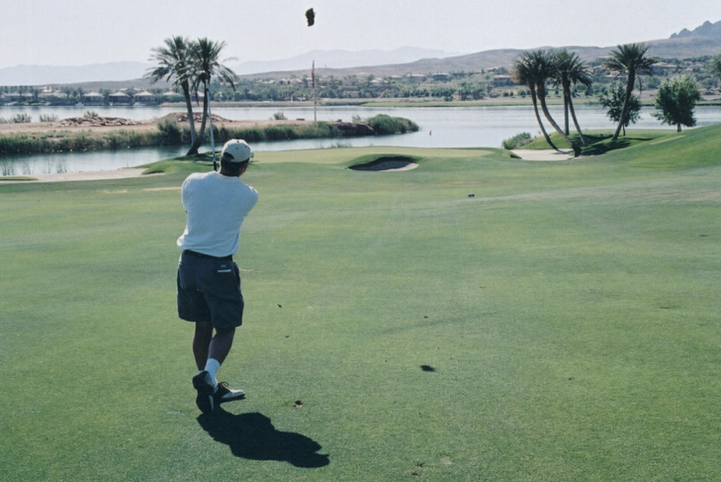 Reflection Bay Golf Course now open!